For a long time the industry has been without Taiyo-Yuden media, with TY having stopped manufacturing discs a number of years ago. For a large portion of the industry this hasn’t mattered and Falcon Media, River Media or ACU-Disc have been an easy choice for quality; but for those who require incredible compatibility, particularly with OEM drives in vehicles, AIO systems, and audiophiles with classic equipment, this has posed a challenge. Now there’s no need to choose niche compatibility over quality playback and archival duration. The Falcon Cyanine CD-R has it all! While many options exist for similar dyes in discs, that may boast of good compatibility, they simply cannot keep up with Falcon Media in terms of quality. As the most modern factory to produce media in the world, Falcon Technologies International have invested huge sums of money into producing a state of the art factory, purpose built for manufacturing optical media, and they haven’t stopped reinvesting and improving upon their own records. The new Cyanine CD-R is no exception, benefiting from extremely low error rates and the most stringent quality control processes, making them consistent, durable and the professionals choice. While disc quality is paramount for low error rates on recording, in which Falcon are a clear market leader, MID’s and dye choice are also primary components of compatibility. As the original manufacturer of CD-R, Taiyo-Yuden discs were used by drive manufacturers as the standard with which to test drives. Of course, with drives optimised for reading and writing TY discs, they were the best to use! By utilising the original Cyanine dyes, Falcon Media are able to emulate this and ensure that, even in older drives, they remain the best. 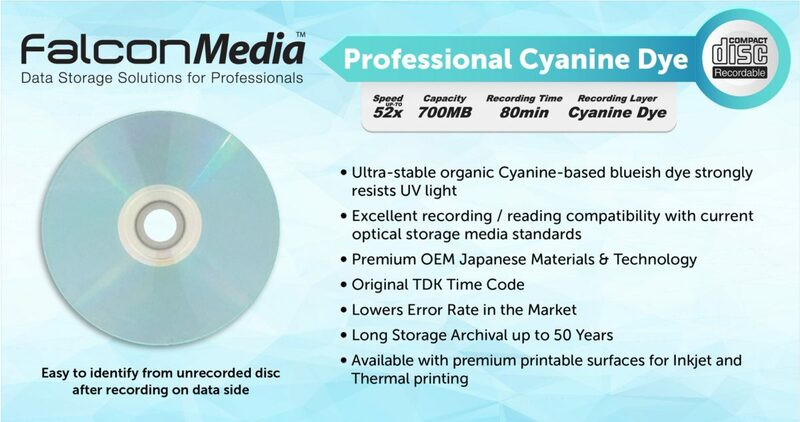 Despite there being no optical media that comes close to Falcon Media Cyanine discs in performance terms, you may be surprised to learn that they are still among the most affordable discs. We’re able to offer such value both due to the efficient, modern manufacturing processes employed by Falcon and us, River Pro Audio, being the Exclusive Master Distributor. Falcon Technologies International recently hosted its Global Sales Managers and Master Distributors in its home Emirate of Ras Al Khaimah. We were delighted to welcome our Global Sales Managers responsible for the Asia Pacific, Middle East & Africa and North-America territories together with our European Master Distributors, River Pro Audio, to discuss the latest developments, opportunities and innovations that make optical media the exciting and progressive industry that it is today. The entire FTI extended a very warm welcome to all the guests, who enjoyed the superb hospitality and fun activities including a Safari in Ras Al Khaimah desert. We certainly had fun with the FTI team out in the UAE and we wish to extend our heartfelt thanks for the welcome shown and the amazing activities. Not only that, but we were pleased to be shown once again around the factory and witness first hand all the new improvements and exciting new capabilities that FTI are rolling out. A truly impressive display and it’s no wonder that they produce the best media in the world! An exceptionally informative meeting that will empower us to continue to offer the best advice and product to our valued customers. London, UK, February 1st 2018 – Optical Media storage specialist River Pro Audio has announced the formation of a key partnership with Falcon Technologies International (FTI) which will see it support the FTI’s new worldwide strategy to increase sales and distribution via closer cooperation with the key players in the global optical media industry. FTI’s new strategy is a pro-active step towards adapting to the shifting market dynamics of the optical media industry, which have evolved in the last 2 years towards consolidation into a smaller number of larger market players within all major territories globally. 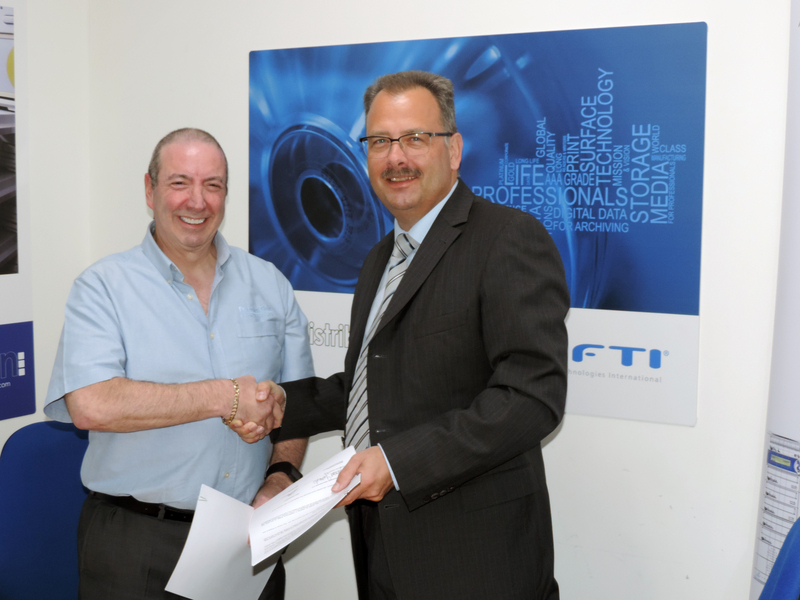 In Europe, FTI has entered into a master distribution agreement with River Pro Audio to cover UK and Ireland. The specialist knowledge, existing distribution network and the long-standing relationship each partner currently enjoys with FTI was a key factor in River Pro Audio’s selection as partners. Joel Monger (River Solutions Group CEO) and Michael Gutowski (Falcon Technologies International CEO) meet to finalise FTI UK & Ireland distribution partnership.